July is the month when the world famous Kenai River attracts sockeye salmon anglers to its banks like some sort of aquatic magnet. In other parts of the state, saltwater anglers are doing their best to boat a halibut and still others targeting salmon have their choice of target species - pinks, chum and coho toward the latter part of the month. Runs of king salmon continue to struggle across the state. There’s no simple explanation as to why. But our department researchers can say with confidence that the most significant factor is poor ocean survival. Something is happening out in the open ocean that is affecting survival of certain species of salmon, especially in their first year in the saltwater. To address these low numbers, the department has been forced to institute restrictions and closures across the board. All harvesters are feeling the pain. Salmon are of great importance to Alaskan anglers. Restrictions to salmon fisheries affect all of us. Decision’s to institute inseason restrictions and closures are not taken lightly by our management staff. These hard decisions are done to protect the resource as mandated by our state’s constitution to ensure we have salmon for future generations. Most anglers are inherent conservationists who believe in the future of their resources. If closures impact your species of choice, pick up a fishing rod and target a different species. Rainbow trout, lake trout, burbot, Arctic grayling, silvers, pinks, chums and sockeye salmon, as well as rockfish and halibut – the list goes on. It would be a shame to allow the month of July to pass without taking to the water, rod in hand. It’s time to get out and catch a few fish. 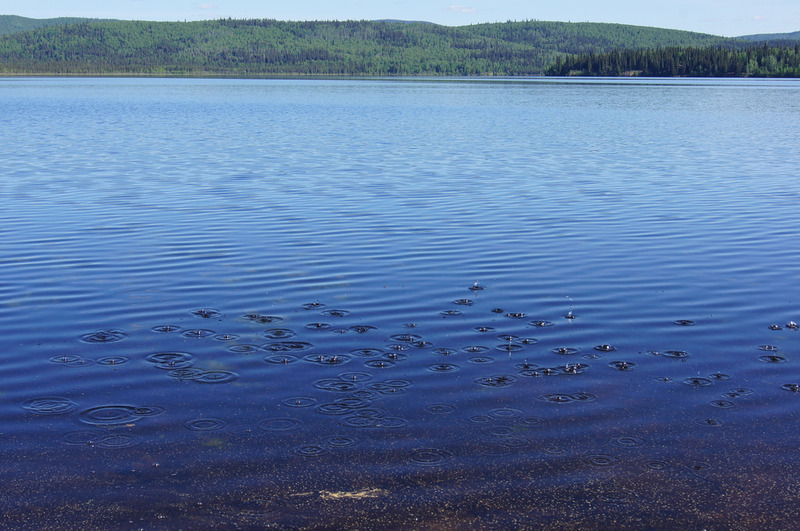 Located just over 20 miles from Fairbanks, Bathing Beauty Pond covers seven acres and has a maximum depth of 18 feet and is very good for shore fishing. Each year the Department of Fish & Game stocks rainbow trout, Arctic char, Arctic grayling, and Chinook salmon for sport anglers to pursue. Northern pike are naturally occurring in the pond as well. If you go, take a good supply of bait such as squid, small pieces of nightcrawler, raw shrimp and salmon eggs. If lures are your tackle of choice, bring along some lead-headed jigs, Swedish pimples, weighted/colored hooks, small airplane jigs. To get to Bathing Beauty Pond from Fairbanks, travel south on the Richardson Highway to mile 343.7 (Moose Creek). Turn south on Eielson Farm Road and drive 50 yards to the pond. It’s summer in Southeast Alaska and the changing season brings an evolution of fishing opportunities. In the marine environment, anglers in southern Southeast Alaska are catching their first summer coho salmon; pink salmon are only weeks away from their natal streams, and bottomfish abound. In Petersburg, Alaska, now is the time to take advantage of a unique fishing opportunity in Blind Slough. Easily accessible from the road system, Blind Slough is the home of Crystal Lake Hatchery, which releases king and coho salmon into the head of the slough. This long, tidally influenced slough provides excellent shoreline fishing opportunity for salmon without the added logistics of launching your boat; perfect for a low stress family outing. By mid-June, king salmon are throwing giant wakes and thrashing the surface as they navigate up Blind Slough towards Crystal Lake Hatchery and the fishing only gets better until mid-July. As king salmon take on their spawning colors and collect near the hatchery, coho salmon begin to arrive in late summer and the action really accelerates around mid-August. Anglers will find easy access to the prime fishing terrain at the Blind River Rapids via a ¼ mile boardwalk trail from the parking area along Mitkof Highway. This trailhead parking has a pit toilet but no running water. Waders are not required but can be helpful to reach additional fishable terrain. Anglers use a variety of tackle including spinners, fly’s and even a baited hook with a float. Blind Slough is often open to the use of bait but check the signboard at the trailhead as you walk by for current fishing regulations or check in with us at the Petersburg Fish and Game office. 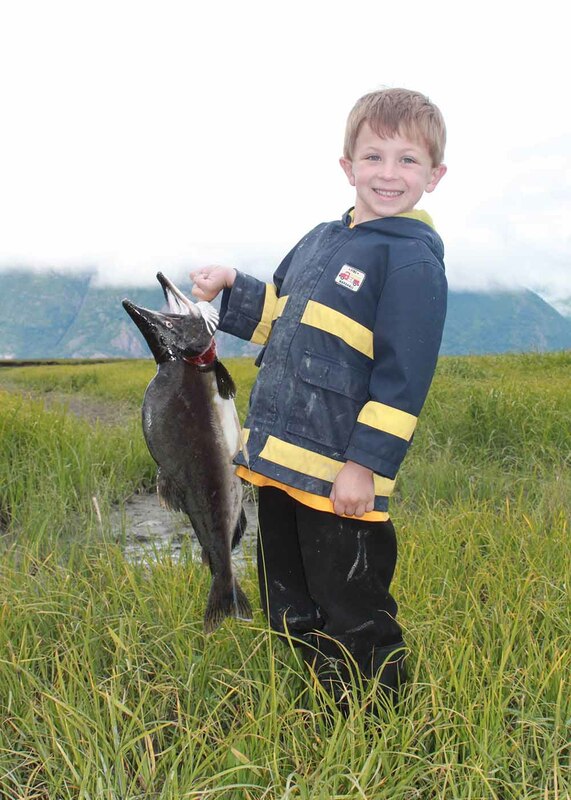 If you’d like to learn about fishing opportunities near you, stop by your local Alaska Department of Fish and Game sport fish office or visit our website. The summer solstice has come and gone. However, in the land of the midnight sun that doesn’t have to impact your fishing adventures. There are still plenty of daylight hours left to hit the waters. Sleep is overrated. In Southcentral, July offers anglers a chance to target a variety of fish species. Sockeye salmon are already present in a lot of waterways with runs continuing to build throughout the month. Pink salmon start to show up around mid-July, and with it being an even year, Whoa Nellie! Hold onto your pole, because the waterways should have an abundance of pink salmon this year. Coho salmon will start trickling in soon. 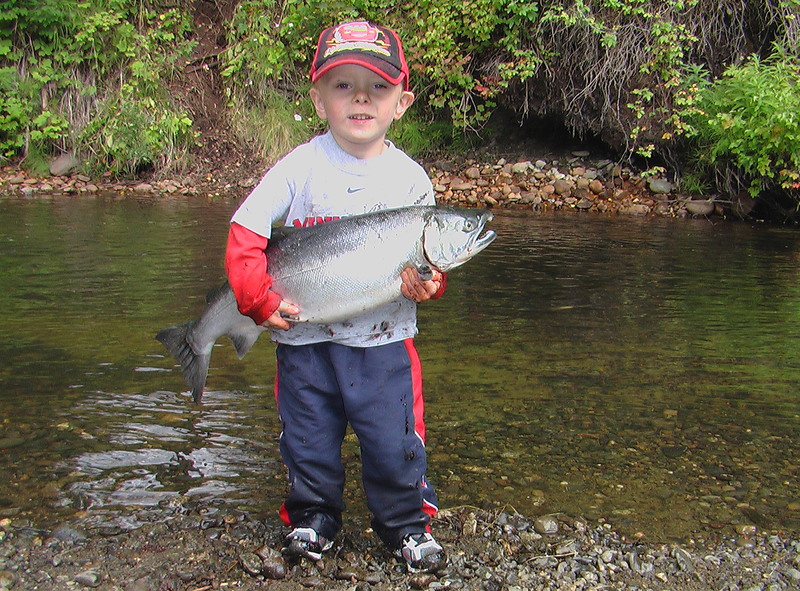 Pinks are one of the easiest salmon to catch on rod and reel, especially for kids. A family-friendly fishing spot is the Resurrection River in Hope. Another great area to take the family camping and away from the crowded river banks is to head north to one of the many streams on the Parks Highway. Let the kids practice their casting skills for rainbow trout, Arctic grayling, and coho and pink salmon at Montana, Willow, or Sheep creeks. If you are looking for a little more action for coho, pink, and chum salmon, give Bird Creek a try after July 14. Be forewarned, this fishery tends to come with a silt facial or mud bath, if you are not careful. Wear chest waders and bring a change of clothes, in case you are one of the unlucky few to fall. This fishery is highly tidally influenced, so be alert to the changing tides and the muddy shores. Lures and bait work well at Bird Creek. Be sure to bring Vibrax and Pixee lures, and some salmon roe to soak under a bobber. Know how to identify your salmon and other fish species! You don’t want to be telling your family and friends you caught a sockeye salmon when really you caught a chum. Check the 2018 Southcentral Sport Fishing Regulations Summary booklet for the daily bag and possession limits for the area you are fishing and to other fishing spots along the way. You have heard and read the stories before, often recounted by anglers. People tell a tale of seeing a UFO and being abducted by aliens. Often, they are laid on gurneys to be poked, prodded, and inserted with tracking devices. Well, imagine the stories a grayling must tell its companions when an Alaskan fish biologist steps out of a boat, captures it, and inserts a radio tag into it for the purpose of revealing its secret migrations. Read the Wildlife News article……. Check out our “How to Fish for Arctic grayling” video! Do you want to know more about fishing for Arctic grayling? Join Fisheries Biologist April Behr as she goes fishing for Arctic grayling in Interior Alaska. Check out our new “how to” deepwater release video! Assistant Area Management Biologist Brittany Blain-Roth provides instruction on how to use a deepwater release mechanism to safely release a yelloweye rockfish showing obvious signs of barotrauma. Are you getting our current news releases and fishing reports by email? Don’t miss out on getting the most current fishing information for your favorite area or hearing when a new emergency order is issued by the Division of Sport Fish. Subscribing is easy! Just follow this link to subscribe to our automated email delivery system. Rockfish are fun to catch and provide a flavorful meal. This month’s scrumptious recipe is brought to you by our friends and the Alaska Seafood Marketing Institute.